Whether you’re a first time Emerald Awards nominator, or you have gone through the process before, we have made some updates to our nominations form to consider while crafting your submission. These changes were created based on the generous feedback we received from a focus group and survey we held earlier this year. We anticipate the changes improve the ability for more creativity, flexibility, and accessibility in your nomination. Below are some updates to the Emerald Awards nominations form you should be aware of. If you have questions or need support, please contact us at info@emeraldfoundation.ca. We’re here to help! We have a new nominations system. We are pleased to announce that we now use Submittable for our nominations system. The online system is used by notable leaders in the publishing and granting sector, including National Geographic, The New Yorker, Stanford University, and The Kennedy Centre. Our experience with their user-friendly system has been wonderful, and we are excited for you to use it for your submission. Best of all, if you have any issues with the system itself, their friendly support staff will be able to provide you answers quickly. Just email them at support@submittable.com and they will get back to you with a solution. You can now upload multimedia support materials – and more of them too! Sometimes showing our judges your work can tell your story better than just a written response. With the update to Submittable, you now have the ability to provide our judges videos, pictures, URLs, PowerPoint presentations, PDFs, and sound files. You are able to submit these materials to each individual section of your nomination, providing the opportunity to showcase different elements of your achievement in creative and dynamic ways. 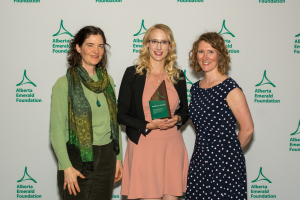 All submitted materials will remain confidential within the Alberta Emerald Foundation and our judges, and will not be shared publicly. We’ve updated the word count. Past nominators may be surprised to see that we have reduced the word count in most sections of the nomination to 100 words. Although this may at first seem limiting, we encourage you to consider using the increased opportunity to submit materials to support your responses. If you’re a wordsmith, we suggest uploading a PDF or a PowerPoint presentation that provides more detailed information. We encourage practicing concision in all your responses and support materials regardless of format as our judges will have many nominations to review. We’ve updated some of our categories. The majority of our Emerald Award categories are the same as last year; however, there are two notable updates. Lifetime Achievement (previously Individual Commitment): Recognizing EcoHeroes who, during their lifetime, have made contributions of outstanding environmental significance. Emerald Challenge: Climate Change (previously Emerald Challenge: Innovation – every three years, this category receives an updated theme): Recognizing an individual or organization that is working to reduce the effects and growth of climate change through innovative actions. If you have questions about which category your nomination fits under, please contact us at info@emeraldfoundation.ca. Also, please note that our judges reserve the ability to move your submission to a different category if it is in the favour of your nomination. Reference letters are no longer required. After hearing about the challenges some nominators were having receiving their reference letters before the deadline, we have decided to provide the option of simply providing a reference. We require their name, business/organization (if applicable), their phone number and email address. We will be contacting all references before providing our judges with the nominations. Submitting a reference letter remains an option as well. Your references’ endorsements of your nomination is still an eligibility requirement. If you are nominating yourself for an Emerald Award, we require two references; however, if you are nominating someone else, we only require one as your nomination is considered the second reference. All the best with your 28th Annual Emerald Award nomination! We look forward to learning about your environmental achievements. SUBMIT YOUR 28TH ANNUAL EMERALD AWARD NOMINATION TODAY. DEADLINE FOR NOMINATIONS IS FEB 8, 2019.